I'm going to give this a provisional date of early 1920's. The illustrator makes this shirt's occupational role explicit by showing our model wearing his hat. The price of the Pictorial pattern is 15 cents. 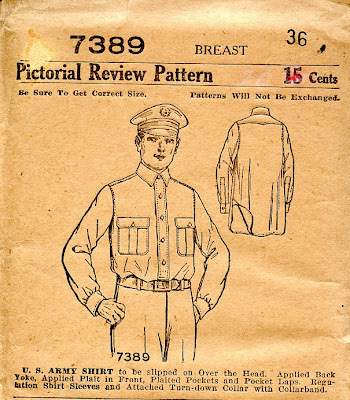 In the 1929 Montgomery Ward catalog, I find that 36" wide, half-wool shirting flannel can be had for 39c a yard. The colors available were khaki tan, gray mixed, wine, dark green, dark brown, navy blue. It's interesting that khaki is the first color listed. Of course, if the man of the house is a little hard to fit, I'll be able lengthen the sleeves or make the neck a little larger. "It's still a puzzle to me why an "Army Shirt" is something that (presumably civilian) men would want." Every man thinks less of himself for not having been a soldier (Dr. Johnson). Why do people wear pea-jackets and trenchcoats, and shop at military surplus stores? There's a cachet about military gear that appeals to the two-fisted adventurer in everyone. We don't know the quality of the Ward's shirt, so it's impossible to say which shirt would have lasted longer, though I think I'd put my money on a well-made home produced shirt. I had a wonderful time searching and reading your site! Very, very enjoyable!! As I get the time to reproduce more clothing I'll re-post the patterns so that they float to the top, so do stop by now and again. is a .pdf file that shows how to make them. They might look a bit retro, but they are code for "My back yard is as big as Texas". Geoff, Many thanks, your PDF is very informative. I had heard the term "bush shirt," but didn't realize its importance in Australia's clothing history. It's impressive that they can be made without using a commercial pattern - truly, necessity is the mother of invention.